A shameless cliffhanger is the biggest disservice a film can offer to a prospective sequel, and that’s exactly what happens to the foundation of the whacky “Insidious: Chapter 2.” You remember the situation well, I’m sure: at the conclusion of the prior endeavor, a key character in the urgent rescue of a young boy was (potentially) possessed by a restless malevolent spirit, resulting in the tragic death of a critical asset to the supernatural fight. When its identity was implied via a picture taken on a digital camera, the screen faded to black and left us with the essential focus question: what happened to all those who are now stuck with a menacing monster? The director, James Wan, is used to that gimmick; after helming the first “Saw” installments – which prided themselves on such last-ditch trickery in order to propel interest through a slog of sequels – he has grown accustomed to the notion of saving the biggest reveal for the final moments. That is acceptable in a series that uses the ploy to audience expectation, but it doesn’t work here, and what both he and his writer have done is given us a follow-up that doesn’t play so much as an isolated story as it does an extended climax. Aside from such maneuvers being a direct violation the principles of an isolated film experience, the results themselves aren’t all that compelling, either. The first “Insidious” was flawed and not nearly what it could have been, perhaps, but still had notable merits: it was well acted, consistent, engaging, and had a good sense of how to build a story to an exciting finale without surrendering exposition or character development. At bare minimum, we enjoyed ourselves. Those who missed out on those virtues are the unluckiest of prospective viewers here, who will be inclined to wander away in paralyzing frustration. How will they identify with the scenarios of this particular entry, which are tossed at the screen with no rhythm or orchestration? What will come of their expectations when they have no clue as to what might be happening, or why? Complicating the matter further, the movie doesn’t even want to stick with just one set of principles, and so many subplots splinter from the source that one quickly loses way in the thick of a ghostly soap opera. Allow me to enlighten you. Following a brief prologue that revisits one Josh Lambert (Patrick Wilson) on the final day of his youthful haunting (which was only referenced early on), we return to the present day to discover a grown man acting strange and distant. Perhaps with good reason: in only a split second of time, he has returned to the waking world after spending a good deal of unconsciousness in “ The Further,” a dark realm of spirits that was imprisoning his young son Dalton (Ty Simpkins). His wife, the panicky Renai (Rose Byrne), is conflicted by his reemergence; the picture she saw on a nearby camera suggests he has been invaded by a disturbing figure dressed in a black wedding dress, but he remains calm and docile, even though the eccentric exchanges. Was it misinterpreted? Is he just tired from the earlier ordeal? The movie doesn’t clarify the reality, and leaves her skepticism dormant in order to drive her hysteria to a conclusion of rather violent confrontations. That provides Wan the chance to take his varying selection of characters (including new ones) off onto their own wild goose chases in order to understand the specifics of two key questions: what happened to poor insightful Elise (Lin Shaye), the psychic who wound up dead in the Lambert living room? ; and where exactly is the menacing spirit that Josh had been fighting off since he was a child? 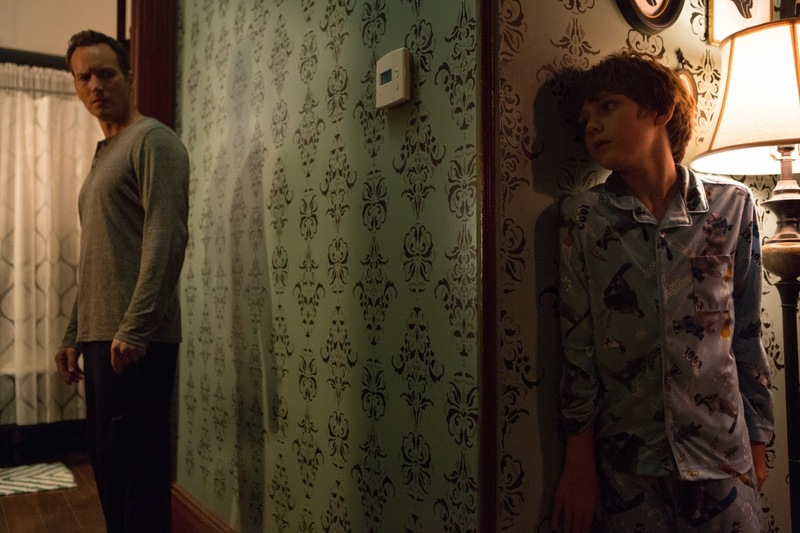 “Insidious: Chapter 2” doesn’t have one key argument in pursuit of answers, so it gives us the full enchilada. As I was watching, I counted six sub-arcs propelling the central story: 1) young Dalton still being haunted by strange figures; 2) Renai wandering the house and seeing the figure of a strange woman consistently stalk and/or threaten her (it even strikes her down in one scene, which is a violation in ghost story 101); 3) the father’s lost spirit trying to reach out to his family via clever means (i.e., playing a song his wife wrote for him on a nearby piano while she is wandering the house searching for the source); 4) a journey on part of supernatural gurus to discover the identity of a dead patient that Josh’s mom (Barbara Hershey) treated years ago at an abandoned hospital, who may have a connection to the hauntings; 5) Elise offering warnings from beyond the human world about the danger imposed on this one particular spirit; and 6) a lengthy trip through The Further to uncover key memories that will (theoretically) tie all situations together. Some directors and writers have no problem juggling the inevitability of complex situations. Many a great film has been made that involve motives of differing directions, especially when they are brought together in moments that play like collective epiphanies. Usually that only intensifies our admiration of the work, and propels the respect of those involved. But “Insidious: Chapter 2” is manic and disorganized, suggesting a lack of focus when the script went through editing stages (assuming it was edited at all), and facilitators that are only interested in the sorts of elaborate exercises they assume audiences want of ambitious follow-ups. Did no one in the editing stage catch the lack of cohesion, though? I struggle in finding reasons for nearly half of these situations are relevant at all. The most unforgiving, if I had to pick, involves a strange time anomaly; as Josh’s wandering spirit is struggling to reach back and acquire possession of his body again, he winds up travelling through the recesses of his own memories in order to find key clues in overthrowing the villain. That means his adult form will be destined to show up in elements of the past, including memories of other characters as well as still photographs. What’s the point? Is the hope of retaking what is yours really so miniscule in a movie like this that it has to arrive at the point by circling back on the chronology of the events, especially when it already is doing so much else? A gimmick like this exists not to fascinate, but to confuse. The movie isn’t merely bad, it’s incompetent – ridiculous in the way it refuses to create central motives, tragic in how it sabotages its own momentum in a display of bi-polar narrative exercises, and cringe-inducing when the actors convey their misplaced confidence in the material in zealous fashion. Oh yes, they believe in what they are doing alright; Rose Byrne is still alluring as an anxious mother who is convinced that not all is well in her happy home world, and Lin Shaye does really good work as the all-knowing seer, even though she has since passed on to the realm of all those ghostly wrong-doers. I even like some of the minor characters, including the two goofy supernatural sidekicks; they prove to be rather good for balancing out the grim tone. But they are fighting a losing battle against a story that doesn’t know where it wants to go, other than various unrelated places that promise exceeding amounts of jolts and violent confrontations. I have seen countless ghost stories in my years as a movie buff, and with that I have also been privy to the compost heap of diluted motives that show up in many of their sequels. “Insidious: Chapter 2” breeds a whole new level of miscalculation – it was made as a patchwork exercise, and the scraps play like inconsolable episodes of something hopeless and confusing.